Honor the memory of a relative or friend or recognize a birthday, wedding, anniversary, retirement or other special event. Your tax deductible donation will underwrite the cost of the bench or tree and its installation. Park Authority staff will install a recognition plaque on each donated bench. Since plaques are not permitted for trees or other living landscape elements, you or your designee will receive a special certificate for each commemorative tree. Please note that NO new bench locations remain available at Riverbend Park or Scotts Run Nature Preserve. However, locations are available at other parks. Because of the unique character of Green Spring Gardens and Huntley Meadows Park, donations may vary. Park Foundation staff will assist prospective donors to identify the options with management of those specialty parks. You may donate a new bench or adopt an existing bench. Park Authority staff will install a donor recognition plaque on the backrest. 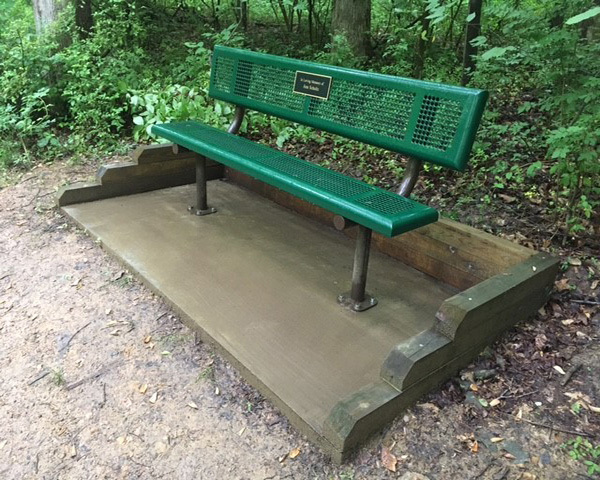 You may choose any park or golf course for a bench adoption but a new bench may only be installed in a park where the manager has identified a need. Some parks and golf courses use different bench styles in keeping with their functions and landscaping. The park manager will work with you in selecting an appropriate bench type and location in the park. Bench recognition plaques will typically be up to 4" x 10" with ½" lettering. Wording is subject to approval by the Park Authority. * If a non-standard bench style is preferred and acceptable to the park manager, the cost may be higher. ** Pending availability of an existing bench suitable for adoption. Bob McLelland enjoys a special bench sponsored in his honor by his loving family. Within a period of ten years following the donation of a steel bench and five years following the donation of a wood bench, the Park Authority will repair or replace the bench if it is severely damaged. To learn more, e-mail the Park Foundation or call 703-324-8532. You may choose any park or golf course with planting availability for your tree donation. The park manager will work with you in selecting a native tree species and location for planting. Your tree will be approximately 1-1/2"-2-1/2" in diameter and 6'-8' tall depending on species. Donations will be accepted throughout the year. However, to assure successful rooting, trees will be planted only twice per year - spring and fall. * If a non-standard tree style is preferred and acceptable to the park manager, the cost may be higher. This includes planting by a commercial nursery and regular watering during the first season of growth. If a larger tree is preferred and acceptable to the park manager, the cost may be higher. 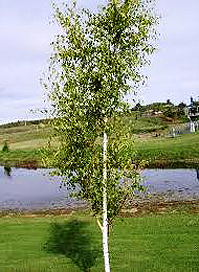 You may also choose to adopt an existing tree whose location or appearance is meaningful to the honoree. Within a period of three years following the donation, the Park Authority will replace the tree if staff determines that it has died or been severely damaged. There are no plaques for commemorative trees. However, an attractive certificate that is suitable for presentation to the honoree or family is available upon request. Full funding for the donation must be received in advance. Donated benches and trees are the property of the Park Authority and are maintained at the same level as other park benches and trees. The Park Authority retains the right to relocate a donated bench and replant or replace a donated tree in a new location. Staff will attempt to contact the donor to select the new location, but the park manager will make the final decision.